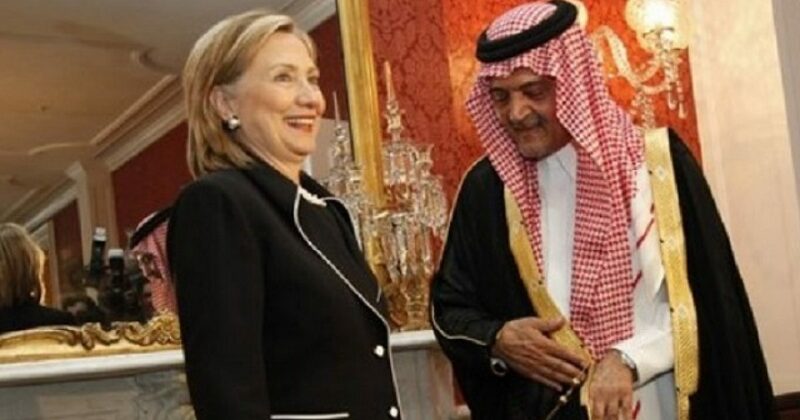 Wonder why the Saudis donated so much money to The Clinton Foundation? Using Trump’s Saudi Arabia example, Saudi Arabia shows up as having given between $10 million and $25 million since the foundation started. When it began in 1997, the foundation’s main goal was to build the Clinton presidential library, although it left open the option to “engage in any and all other charitable, educational and scientific activities” that nonprofits are allowed to do under federal law. The Washington Post reported that Saudi Arabia gave about $10 million to build the library. (According to the Post, the Saudis gave a similar amount to the George H.W. Bush library.) After the library donation, the Saudis gave very little and stopped giving entirely during the time Clinton was secretary of state. She stepped down in early February 2013. Undoubtedly the Clintons built a pay-for-play scheme. And in one of the latest revelations by WikiLeaks, we learn that the Clintons provided cover for their “clients”. We wrote earlier about Cablegate, where the Hillary Clinton-controlled State Department colluded with the New York Times to run interference on potential negative news. In the latest WikiLeaks, you will see that NY Times’ Scott Shane actually worked with Hillary Clinton’s team on news. In this particular leak, note how Shane provides in advance what the NYT will print. The list is a rundown, and allowed the Clinton state department to get a heads up on news. This is the media industrial complex set up by the Clintons. And reporters and Leftist news outlets were all too happy to help, because they are inherently lazy. The saying, “You scratch our back…” applied. Don’t think America’s media uncovered this latest dirt. We have Judicial Watch and WikiLeaks to thank instead. Several emails with classified information from former Hillary Clinton aide Huma Abedin were among a tranche of documents released Friday that were found on Anthony Weiner’s personal computer during an FBI probe. The public release of the documents uncovered by the FBI included Clinton’s daily schedule, conversations about media interviews, traveling arrangements and talking points for calls with heads of nations around the world. We haven’t entered 2018 yet, and one can already see where things are headed for Democrats. As Nancy Pelosi would say, “Armageddon!”, at least for Democrats.